Whether you are an Olympic swimmer or someone who is stepping into a swimming pool for the first time, odds are you are going to end up using some form of equipment to assist you while in the water. Equipment ranges in purpose from tools used in competitive swimming, to recreational equipment for snorkeling and other water sports. New swimmers especially depend on swimming equipment to help with form and technique when learning new strokes in the water. 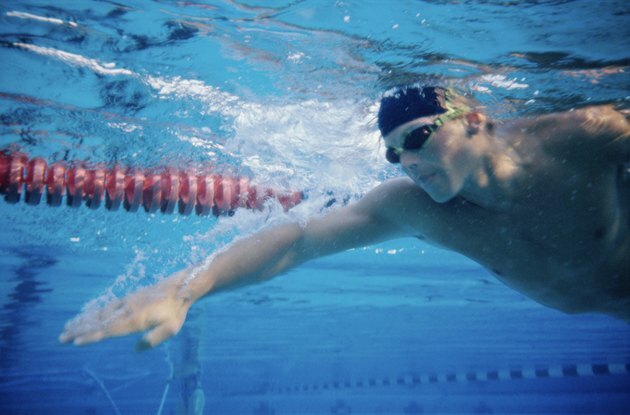 Some swimmers use earplugs to block water from entering the ear canal while they are swimming. Excess water entering the ear can cause discomfort for several hours after swimming and can also increase your chances of developing an outer ear infection, known as "swimmer's ear." Some swimmers also use nose clips to prevent water from entering their nose while they are swimming. Most pools contain high levels of chlorine or other chemicals to help keep the water free of bacteria and control the growth of algae in the water, states the Environmental Protection Agency. However, chlorine can irritate the eyes. Goggles allow you to see while your head is immersed in the water, without having to worry about chlorine irritation. Numerous pieces of swimming equipment are designed to help in strength training and technique while swimming. For example, pull buoys are foam flotation devices that can be placed between the legs and used to strengthen and place focus on arm technique. The pull buoy forces swimmers to rely less on their legs to push through the water and more on the arms. Swim paddles develop arm strength by increasing resistance in the water, and they also help develop proper stroke mechanics. Kickboards switch the majority of work onto the legs when swimming to strengthen the legs as well as help develop proper kicking technique, states the U.S. Masters Swimming organization. Stretch cords and resistance bands develop both arm and leg strength. The swim cap is a piece of equipment that provides multiple benefits. For professional swimmers, swim caps reduce drag to increase speed in the water. Swim caps also keep hair out of the face, help reduce the effects of chlorine on the hair and help swimmers retain body heat when they are swimming in colder water. Competitive swimmers use several additional pieces of equipment. For example, coaches and timers at meets use stopwatches to help keep track of completion times for swimmers. Swimmers use lap counters in competition to help keep track of how many more laps they need to complete their event. Lane dividers consist of buoys that are strung on ropes and placed across the pool to divide the water into several swimming lanes. Some swimming equipment falls in the recreational category, including devices such as snorkeling masks and swimming fins, which allow swimmers to navigate natural aquatic environments such as lakes, seas and the ocean.